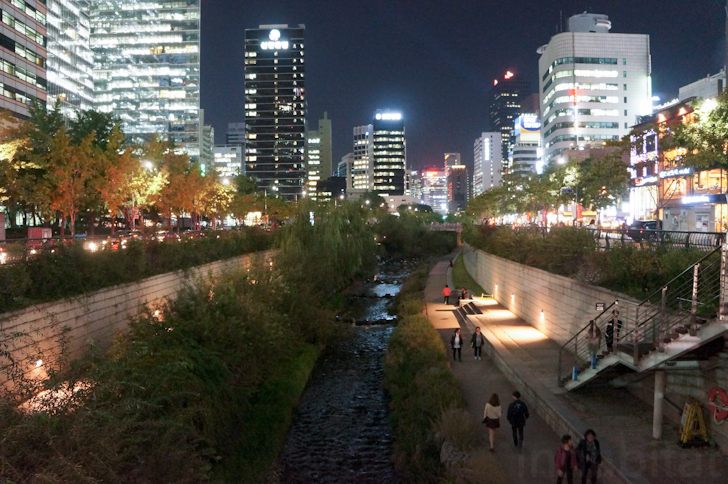 At the heart of Seoul lies one of the world's greatest urban design projects: the Cheonggyecheon River linear park. A green oasis in a concrete jungle, this inspiring urban renewal success underwent a dramatic transformation from a traffic-choked elevated freeway and concrete paved waterway into a lush, 3.6-mile-long “day-lit” stream corridor that attracts over 60,000 visitors daily. The restoration process has also provided huge boosts to local biodiversity and catalyzed economic development. 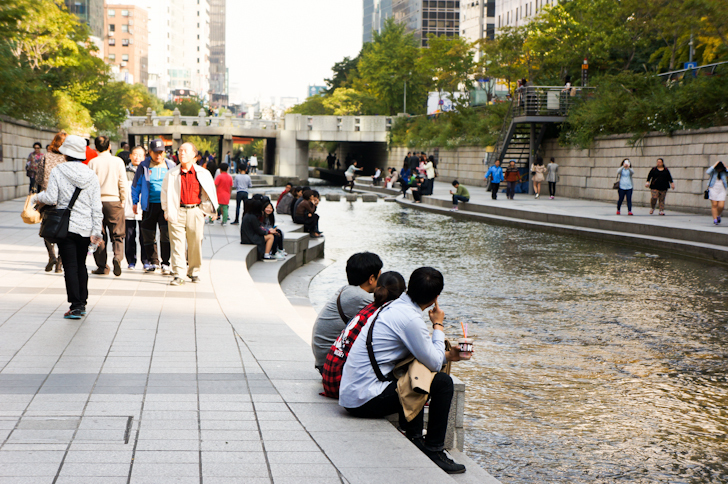 Keep reading to learn the story behind Seoul's ambitious stream recovery project and to flip through our gallery for pictures of the inspiring urban park. The Cheonggyecheon project is remarkable for its dramatic transformation from a seedy industrial eyesore to a nature-filled public space. In the 1940s, the Cheonggyecheon had deteriorated into an open sewer and was thus paved over with concrete for sanitation reasons. Thirty years later, an elevated freeway was built overtop the channelized river, further removing it from the public. Like many of the world’s underpasses, the area beneath the freeway was mostly avoided by the public, which considered the space rife with criminal activity and illegal dumping. At the turn of the millennium however, then mayor and future president of Korea Lee Myung-Bak successfully campaigned on a promise to remove the freeway and restore the Cheonggyecheon. From 2002 to 2005, the government ripped out the road and replaced it with a 3.6-mile restored and planted stream with parallel roadways. The mayor also won support for the project by framing the project as a major flood relief channel and marketing the restoration as a highly visible, sustainable development that would boost Korea’s image around the world. To alleviate fears of traffic congestion, the government also invested heavily in public transportation, such as a dedicated bus lane. In just 29 months, the outmoded elevated highway was transformed into a multifunctional, contemporary linear park. Because of urban development however, the project is not a “restoration” in the strictest sense of the word. Its hefty $360 million price tag and unsustainable water practices–the Cheonggyecheon is fed by heavily treated water pumped from the larger Han River, rather than recycled wastewater–has also drawn criticism. Still, the advantages of the Cheonggyecheon design outweigh the cons. The project’s many benefits include a significant increase in overall biodiversity, a reduction in the urban heat island effect and air pollution, improvement in public transit ridership and the downtown quality of life, and greater economic development in the surrounding area. The Cheonggyecheon flows east to west in the heart of Seoul, starting from the Cheonggyecheon Plaza, equipped with market stands for food and craft vendors. The stream shape also changes as it flows westward and becomes progressively more “natural” and marsh-like as it flows downstream. Open at all hours, the linear park is fully integrated into Seoul’s urban fabric and is host to hundreds of events and art installations every year. The park is brimming with people, even late at night, making the space an attractive safe haven. Considered a flagship project, the completion of the Cheonggyecheon has spurred the development of various other river restoration projects around Korea and inspired other daylighting projects around the world. 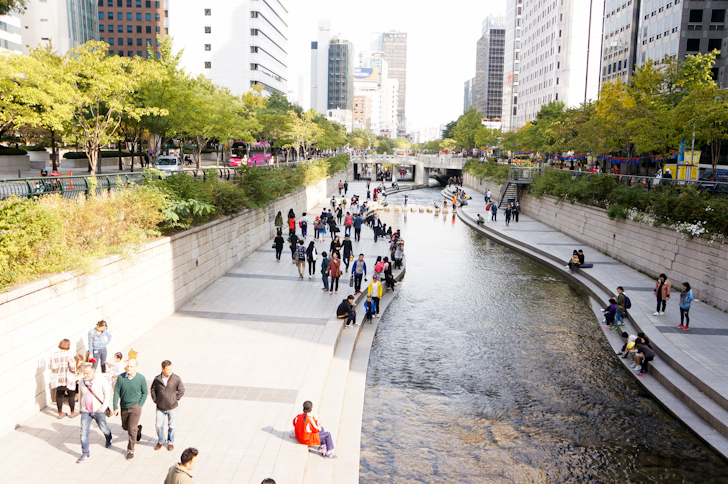 Click through our Flickr Gallery to see more images of the Cheonggyecheon. Considered a flagship project, the completion of the Cheonggyecheon has spurred the development of various other river restoration projects around Korea and inspired other daylighting projects around the world. The Cheonggyecheon project is remarkable for its dramatic transformation from a seedy industrial eyesore to a nature-filled public space. The water is heavily treated so that visitors can play in the stream. The linear park serves as a major flood relief channel and can sustain a flow rate of 118mm/hr. The park becomes progressively more "natural" and marsh-like as it flows downstream. People flock to the Cheonggyecheon at all hours, but nighttime is particularly popular with couples. Stepping stones provide a fun way to cross the river. The park significantly reduced the urban heat island effect by replacing paved roads with vegetation. The amount of biodiversity flourished since the completion of park in 2005. An underpass is used as a small museum to explain the benefits and ecology of the Cheonggyecheon. The Cheonggyecheon hosts many events and installations every year, including this temporary hydro-powered cell phone charger. To alleviate fears of traffic congestion, the government also invested heavily in public transportation, such as a dedicated bus lane. The park also reduced the amount of small-particle air pollution by over 30%. The park is lit up and brimming with people at night. At the turn of the millennium however, then mayor and future president of Korea Lee Myung-Bak successfully campaigned on a promise to remove the freeway and restore the Cheonggyecheon. Many locals use the park as a "pedestrian highway" to cut across the city without needing to wait at streetlights.